This article is about all true hornets. For other uses, see Hornet (disambiguation). Hornets (insects in the genus Vespa) are the largest of the eusocial wasps, and are similar in appearance to their close relatives yellowjackets. Some species can reach up to 5.5 cm (2.2 in) in length. They are distinguished from other vespine wasps by the relatively large top margin of the head and by the rounded segment of the abdomen just behind the waist. Worldwide, there are 22 recognized species of Vespa, Most species only occur in the tropics of Asia, though the European hornet (Vespa crabro), is widely distributed throughout Europe, Russia, North America and Northeast Asia. Wasps native to North America in the genus Dolichovespula are commonly referred to as hornets (e.g., baldfaced hornets), but are actually yellowjackets. Like other social wasps, hornets build communal nests by chewing wood to make a papery pulp. Each nest has one queen, who lays eggs and is attended by workers who, while genetically female, cannot lay fertile eggs. Most species make exposed nests in trees and shrubs, but some (like Vespa orientalis) build their nests underground or in other cavities. In the tropics, these nests may last year-round, but in temperate areas, the nest dies over the winter, with lone queens hibernating in leaf litter or other insulative material until the spring. Hornets are often considered pests as, except for the European hornet, they aggressively guard their nesting sites when threatened. The European hornet, however, rarely attacks people, even those close to its nest. Other species, however, should be treated with great respect as their stings can be more dangerous than those of bees. In Vespa crabro, the nest is founded in spring by a fertilized female known as the queen. She generally selects sheltered places such as dark, hollow tree trunks. She first builds a series of cells (up to 50) out of chewed tree bark. The cells are arranged in horizontal layers named combs, each cell being vertical and closed at the top. An egg is then laid in each cell. After 5–8 days, the egg hatches, and in the next two weeks, the larva undergoes its five stages. During this time, the queen feeds it a protein-rich diet of insects. Then, the larva spins a silk cap over the cell's opening and, during the next two weeks, transforms into an adult, a process called metamorphosis. The adult then eats its way through the silk cap. This first generation of workers, invariably females, now gradually undertakes all the tasks formerly carried out by the queen (foraging, nest building, taking care of the brood, etc.) with the exception of egg-laying, which remains exclusive to the queen. As the colony size grows, new combs are added, and an envelope is built around the cell layers until the nest is entirely covered, with the exception of an entry hole. To be able to build cells in total darkness, they apparently use gravity to aid them. At the peak of its population, which occurs in late summer, the colony can reach a size of 700 workers. At this time, the queen starts producing the first reproductive individuals. Fertilized eggs develop into females (called "gynes" by entomologists), and unfertilized ones develop into males (sometimes called "drones"). Adult males do not participate in nest maintenance, foraging, or caretaking of the larvae. In early to mid autumn, they leave the nest and mate during "nuptial flights." Other temperate species (e.g., the yellow hornet, V. simillima, or the Oriental hornet, V. orientalis) have similar cycles. In the case of tropical species (e.g., V. tropica), life histories may well differ, and in species with both tropical and temperate distributions (such as the Asian giant hornet, Vespa mandarinia), the cycle likely depends on latitude. Hornets are found mainly in the Northern Hemisphere. The common European hornet (Vespa crabro) is the best-known species, widely distributed in Europe (but is never found north of the 63rd parallel), Ukraine and European Russia (except in extreme northern areas). In the east, the species' distribution area stretches over the Ural Mountains to Western Siberia (found in the vicinity of Khanty-Mansiysk). In Asia, the common European hornet is found in southern Siberia, as well as in eastern China. The common European hornet was accidentally introduced to eastern North America about the middle of the 19th century and has lived there since at about the same latitudes as in Europe. However, it has never been found in western North America. The Asian giant hornet (Vespa mandarinia) lives in the Primorsky Krai, Khabarovsky Krai (southern part) and Jewish AO regions of Russia, China, Korea, Taiwan, Cambodia, Laos, Vietnam, Indochina, India, Nepal, Sri Lanka and Thailand, but is most commonly found in the mountains of Japan, where they are commonly known as the giant sparrow bee. The Oriental hornet (Vespa orientalis) occurs in semi-dry sub-tropical areas of Central Asia (Armenia, Dagestan in Russia, Iran, Afghanistan, Oman, Pakistan, Turkmenistan, Uzbekistan, Tajikistan, Kyrghyzstan, southern Kazakhstan), southern Europe (Italy, Malta, Albania, Romania, Turkey, Greece, Bulgaria, Cyprus), North Africa (Algeria, Libya, Egypt, Sudan, Eritrea, Somalia) and along the shores of the Gulf of Aden and in the Middle East. It has been introduced to Madagascar. The Asian hornet (Vespa velutina) has been introduced to France, Spain, Portugal and Italy. Hornets have stings used to kill prey and defend hives. Hornet stings are more painful to humans than typical wasp stings because hornet venom contains a large amount (5%) of acetylcholine. Individual hornets can sting repeatedly; unlike honey bees, hornets and wasps do not die after stinging because their stingers are very finely barbed (only visible under high magnification) and can easily be withdrawn and so are not pulled out of their bodies when disengaging. 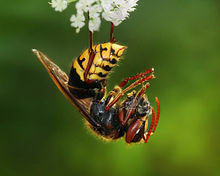 The stings of the Asian giant hornet (Vespa mandarinia) are among the most venomous known, and are thought to cause 30–50 human deaths annually in Japan. Between July and September 2013, hornet stings caused the death of 42 people in China. Asian giant hornet's venom can cause allergic reactions and multiple organ failure leading to death, though dialysis can be used to remove the toxins from the bloodstream. People who are allergic to wasp venom are also allergic to hornet stings. Allergic reactions are commonly treated with epinephrine (adrenaline) injection using a device such as an epinephrine autoinjector, with prompt follow-up treatment in a hospital. In severe cases, allergic individuals may go into anaphylactic shock and die unless treated promptly. Hornets, like many social wasps, can mobilize the entire nest to sting in defense, which is highly dangerous to humans and other animals. The attack pheromone is released in case of threat to the nest. In the case of the Asian giant hornet (Vespa mandarinia) this is also used to mobilize many workers at once when attacking colonies of their prey, honey bees and other Vespa species. Three biologically active chemicals, 2-pentanol, 3-methyl-1-butanol, and 1-methylbutyl 3-methylbutanoate, have been identified for this species. In field tests, 2-pentanol alone triggered mild alarm and defensive behavior, but adding the other two compounds increased aggressiveness in a synergistic effect. In the European hornet (Vespa crabro) the major compound of the alarm pheromone is 2-methyl-3-butene-2-ol. If a hornet is killed near a nest it may release pheromones that can cause the other hornets to attack. Materials that come in contact with these pheromones, such as clothes, skin, and dead prey or hornets, can also trigger an attack, as can certain food flavorings, such as banana and apple flavorings, and fragrances that contain C5 alcohols and C10 esters. Adult hornets and their relatives (e.g., yellowjackets) feed themselves with nectar and sugar-rich plant foods. Thus, they can often be found feeding on the sap of oak trees, rotting sweet fruits, honey and any sugar-containing foodstuffs. Hornets frequently fly into orchards to feed on overripe fruit. Hornets tend to gnaw a hole into fruit to become totally immersed into its pulp. A person who accidentally plucks a fruit with a feeding hornet can be attacked by the disturbed insect. The adults also attack various insects, which they kill with stings and jaws. Due to their size and the power of their venom, hornets are able to kill large insects such as honey bees, grasshoppers, locusts and katydids without difficulty. The victim is fully masticated and then fed to the larvae developing in the nest, rather than consumed by the adult hornets. Given that some of their prey are considered pests, hornets may be considered beneficial under some circumstances. The larvae of hornets produce a sweet secretion containing sugars and amino acids that is consumed by the workers and queens. European hornet with the remnants of a honey bee. While taxonomically well defined, there may be some confusion about the differences between hornets and other wasps of the family Vespidae, specifically the yellowjackets, which are members of the same subfamily. 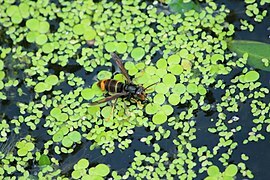 Yellowjackets are generally smaller than hornets and are bright yellow and black, whereas hornets may often be black and white. There is also a related genus of Asian nocturnal vespines, Provespa, which are referred to as "night wasps" or "night hornets", though they are not true hornets. Some other large wasps are sometimes referred to as hornets, most notably the bald-faced hornet (Dolichovespula maculata) found in North America. It is set apart by its black and ivory coloration. 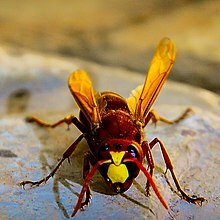 The name "hornet" is used for this and related species primarily because of their habit of making aerial nests (similar to the true hornets) rather than subterranean nests. Another example is the Australian hornet (Abispa ephippium), which is actually a species of potter wasp. Vespa mandarinia japonica (sometimes known as Japanese giant hornet) – the largest wasp, and the most venomous known insect (per sting). European hornet Vespa crabro, (sometimes known as Old World Hornet, or Brown Hornet). Japanese hornet Vespa simillima (sometimes known as Japanese yellow hornet). Vespa luctuosa the most lethal wasp venom (per volume). ^ James M. Carpenter & Jun-ichi Kojima (1997). "Checklist of the species in the subfamily Vespinae (Insecta: Hymenoptera: Vespidae)" (PDF). Natural History Bulletin of Ibaraki University. 1: 51–92. ^ Archer, M.E. (2012). Penney, D., ed. Vespine wasps of the world: behaviour, ecology and taxonomy of the Vespinae. Monograph Series. 4. Siri Scientific. ISBN 9780956779571. OCLC 827754341. ^ Vetter, Richard S.; Visscher, P. Kirk; Camazine, Scott (1999). 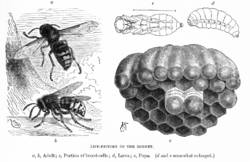 "Mass Envenomations by Honey Bees and Wasps". Western Journal of Medicine. 170 (4): 223–227. PMC 1305553. PMID 10344177. ^ Dieter Kosmeier. "Vespa orientalis, Oriental Hornet". vespa-crabro.de. ^ K. D. Bhoola; J. D. Calle; M. Schachter (1961). "Identification of acetylcholine, 5-hydroxytryptamine, histamine, and a new kinin in hornet venom (V. crabro)". J. Physiol. 159 (1): 167–182. doi:10.1113/jphysiol.1961.sp006799. PMC 1359584. PMID 13868844. ^ Conniff, R. (June 2003). "Stung – How tiny little insects get us to do exactly as they wish". Discover. ^ a b c d e J.O. Schmidt; S. Yamane; M. Matsuura; C.K. Starr (1986). "Hornet venoms: lethalities and lethal capacities". Toxicon. 24 (9): 950–4. doi:10.1016/0041-0101(86)90096-6. PMID 3810666. ^ P. Barss (1989). "Renal failure and death after multiple stings in Papua New Guinea. Ecology, prevention and management of attacks by vespid wasps". Med J Aust. 151 (11–12): 659–63. PMID 2593913. ^ a b Park, Madison; Zhang, Dayu; Landau, Elizabeth (October 3, 2013). "Deadly giant hornets kill 42 people in China". CNN. Archived from the original on October 4, 2013. ^ "Insect bites and stings: MedlinePlus Medical Encyclopedia". ^ a b c "Volatile fragrance chemicals may attract unwanted attention from hornets and bees". ^ Madl, M (2012). "Notes on the genus Provespa Ashmead, 1903 (Insecta: Hymenoptera: Vespidae: Vespinae) based on the material of the Naturhistorisches Museum Wien (Austria)" (PDF). Annals Naturhistorisches Museum Wien. 114: 27–35. Retrieved 10 March 2016. Look up hornet in Wiktionary, the free dictionary.